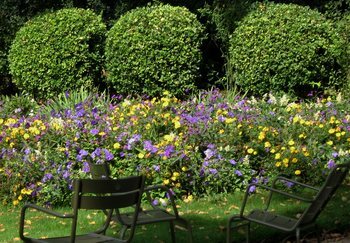 The Luxembourg Gardens has so very many wonderful places to sit and enjoy beautiful weather. 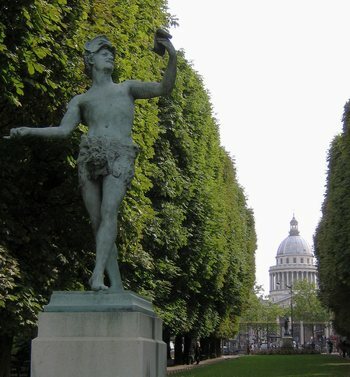 Statue of a Greek actor on the east side of the Luxembourg Gardens. In the background is the Panthéon. The Gardens, run by the French Senate, have informative kiosques that explain the history of the place and provide a lovely, colorful map. 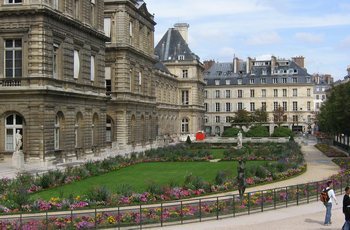 The garden on the east side of the Luxembourg Palace, where the Senate meets. The pond in the middle of the Gardens is a popular spot on a warm day. 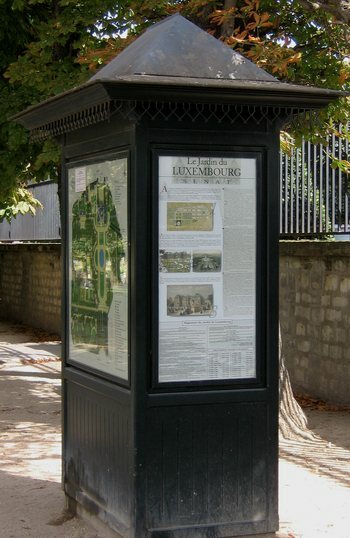 This is the only remaining of four sample meters that the government placed here and there in Paris, to encourage citizens to switch over to the “new” form of measurement. This is on rue Vaugirard, across from the Senate. You could bring your string or stick of wood, and mark it for use as a “yardstick.” The French invented the meter, you know. Last Saturday night, in our attempts to find a reasonably priced restaurant that could accommodate us without a reservation in the busy Saint-Germain-des-Prés area, we passed a place called Le Relais de l’Entrecote on rue Saint-Benoit, very near the brasserie Le Petit Benoit where we did finally dine. What impressed me that night about Le Relais de l’Entrecote was the long line of people waiting to be seated. We made note of that, and vowed to go back on a week night at a slightly earlier time than we normally dine. Last night was that night. I didn’t even remember the name of the restaurant, only its location and that memorable line of people waiting. As we approached, I saw the name and thought, good, Tom will be happy, it is a steakhouse. It is hard to get him to agree to go into a restaurant that has mostly fish and little meat on the menu, and there are plenty of places like that in Paris. We did not have to wait, but the restaurant was already very busy at 7:45PM. Everyone working there was female. That is very unusual. In Paris, by far most servers are male. These women were all wearing well-fitted black skirts (not short) and black knit tops with white collars and white aprons. But these were not frilly French outfits. They looked somewhat austere, as if they were all from some conservative Protestant sect that believes in well-fitted black and white clothing. As soon as we were seated, our waitress appeared, not with a carte, but with a question: How would we each like to have our meat cooked? I immediately answered “a point” (supposedly medium, but really more like medium rare in France). Tom was a bit confused, so I repeated the question to him in French so that our waitress would not start trying to speak English to us. He managed to order a big bottle of mineral water before the waitress disappeared. She soon reappeared with the water and a nice, simple fresh green salad with walnuts and a light vinaigrette for each of us. I then asked if it would be possible for me to have a half bottle of red wine. I had spotted these half bottles on a shelf behind Tom. They were labeled with the name of the restaurant, so I thought this wine would probably be a good value. So, there we were, eating in a fairly big restaurant that was already almost full of people, where everyone was having the same meal! The only decisions to be made here are how you want your meat cooked, what you want to drink, if you are going to have dessert, which dessert, and if you are going to have coffee after. The wine quickly appeared. It was good – a Bordeaux, I think - except that they serve it chilled. Maybe if I asked for it at room temperature, not cold, it would be possible to have it served that way. Sometime after the salad and before the main course was served, two youngish men were seated next to us. One was clearly American, and the other was European (maybe French, or maybe Italian, but he clearly was fluent in French and his English was only somewhat accented). The European obviously knew about this place and had been given the task of taking this American guy out to dinner. They didn’t really seem to be friends, just work associates. I was already figuring out that the steak and fries were served to each person at least twice. Tom and I were speculating about whether or not this was an “all you can eat” place, which would be very un-French. Could this be some version of that gross steakhouse in Amarillo where people are encouraged to overeat??? Then I heard the European man next to Tom tell his American assignment that “they serve you twice here.” After a little while, I explained to Tom that what we were seeing was people being given second helpings. The steak arrived promptly. Our waitress put the steak platter and the fries platter each on a little stand on a table behind me. There was a warming candle under each platter. She carefully put a couple slices of steak on a plate, then a serving of fries, then she carefully spooned the wonderful pepper sauce over the steak slices. She repeated the process. And we were served. European steak is notoriously tough and chewy, normally. But not this steak. It was superb. An “entrecote” is a rib steak. I saw reviews on the web this morning that indicate some Americans who have been to this restaurant mistakenly thought this was filet mignon! That’s how tender it was. But I could tell by the shape of the steak and the texture of the muscle fibers that it was a rib steak. A fine one. The fries were quite good. We were served our seconds, and we were quite content. We did look at the dessert menu, for information purposes only. The list of desserts is more extensive than we would have expected. They include the items one typically finds on a French brasserie/restaurant menu. All were very reasonably and very precisely priced. For example, items were priced at 5.10, 5.30, or 5.80. There was no rounding up to the nearest half euro. We had no idea how much we would be charged for this meal. Nothing that we could see was posted inside or outside. We just knew, if it was this popular, it had to be reasonable. Indeed, each steak dinner cost 21.50. Tom’s mineral water was 4.50, and my wine was 9. Not really cheap, but a very good value, considering the high quality food (and of course, these prices include tax and tip). And if you like fast, efficient service – well, I’ve never seen anything better in France. The place must be owned and managed by a woman. We were entertained by the European man’s efforts to explain things to the klutzy American man seated next to us. The phrase “a point” was something the American just could not, or would not, pronounce. He kept saying “a pois” instead. I thought, if he isn’t more careful, someone will serve him peas with his steak! Note: If you order steak in another Parisian restaurant, pay at least 23 euros for your main course. If you pay less, you will have a tough, chewy steak.